This means if you want to use the export metadata from FDMEE to DRM then you will need to be using one of the above source systems. Even though importing data load mapping from DRM to FDMEE is aimed at mapping from ERP systems to EPM applications it is still possible to use the functionality if the source is not an ERP system. To be able to integrate with DRM then not only do you need to be on FDMEE 11.1.2.4.200+ you also need to be running at least DRM 11.1.2.4.340. Assuming you are running the required versions then there are a number of other prerequisites that need to be in place before you can jump into the FDMEE and DRM integration. In this first post I am going to go through getting DRM up and running with Web Services as this is the core mechanism in the integration between the two products. DRM has two types of Web Services available, the Web Service that has been around for a long time which uses the SOAP protocol and requires Oracle Web Services Manager (OWSM) and the latter addition which is the DRG Rest Service for use with the EPM mobile application. 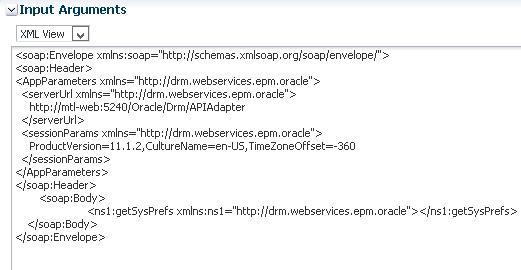 FDMEE integrates with DRM using the SOAP protocol which adds a lot of configuration overhead compared to the REST service, hopefully one day Oracle will standardise and convert DRM to only use REST which seems to be more favourable these days and in my opinion a lot easier to work with. 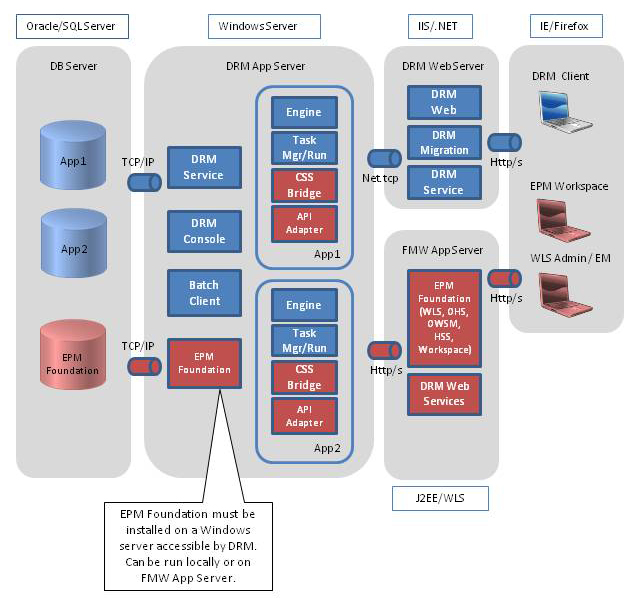 I will be focusing on the FMW App Server area in the diagram to get the Web Services up and running. The assumption I am going to take is that DRM 11.1.2.4.340+ has been installed and configured to use Shared Services for authentication. Metadata Services Schema (MDS) creation for OWSM. 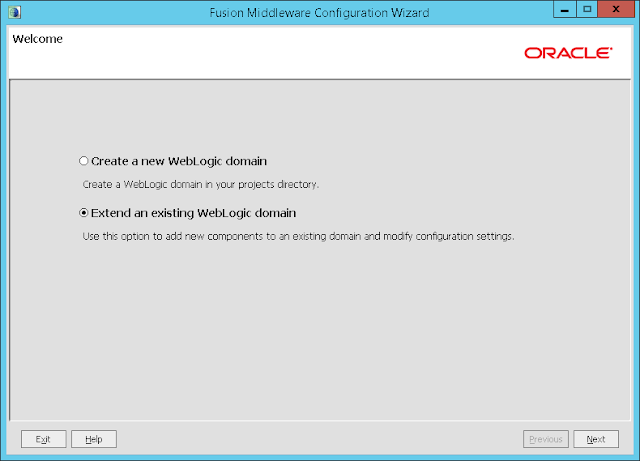 WebLogic configured to use an external provider. Deploy the DRM Web Services application. 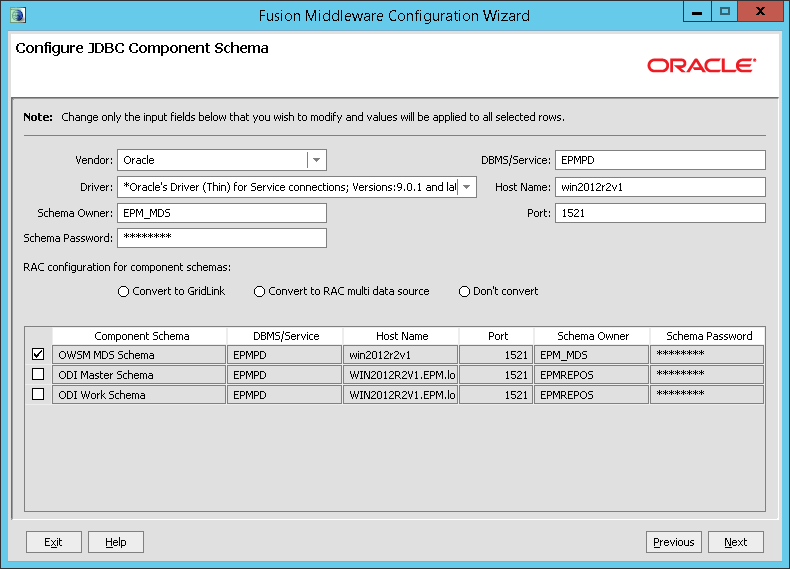 So let us start with the MDS schema creation for OWSM, to create the schema the Repository Creation Utility (RCU) is required and as EPM 11.1.2.4 uses FMW 11.1.1.7 then that is the version of the utility that should be downloaded. 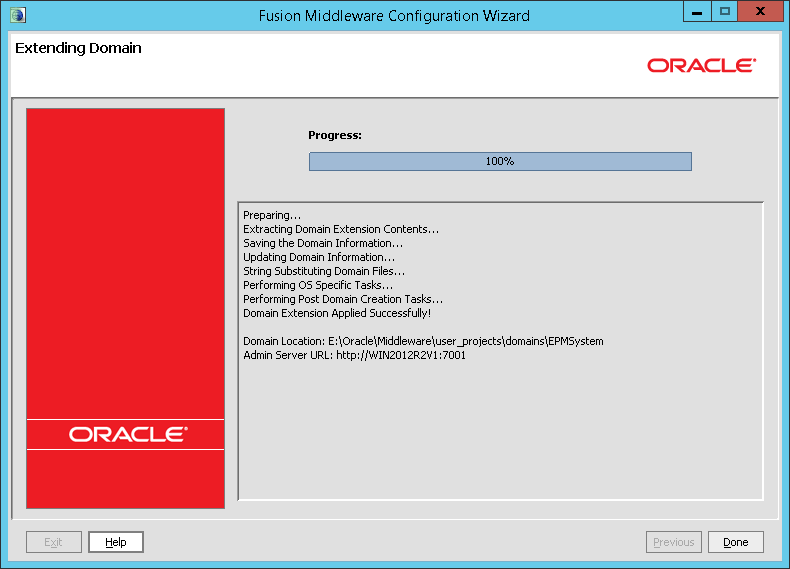 You should be able to download this from Oracle Software Delivery Cloud or the Oracle Technology Network. 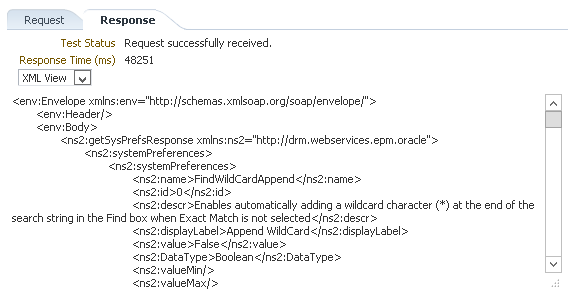 The utility can run from any machine that has access to the database where the MDS schema will be created. 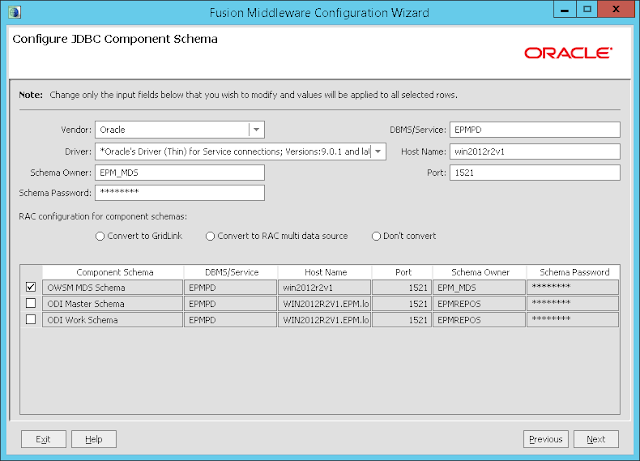 Now that the schema is available OWSM can be configured. 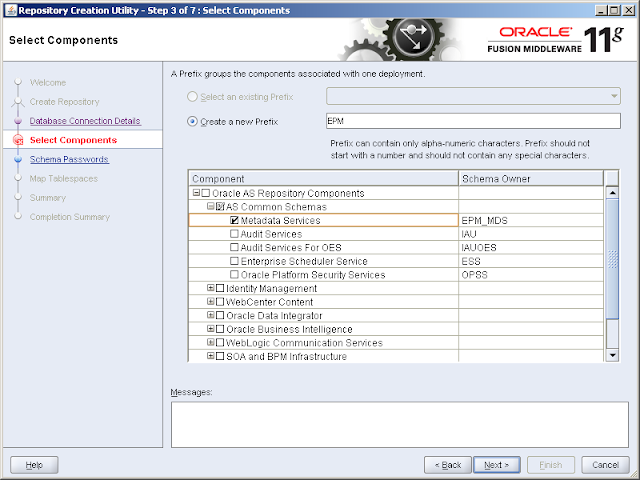 At the “Configure JDBC Component Schema” section enter the database connection information to the MDS schema. Now that OWSM has been configured the next step is make the deployment available and this is done through the WebLogic admin console. 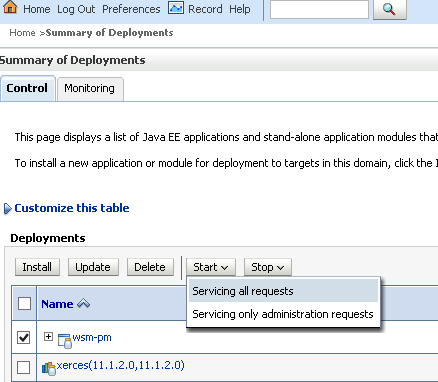 Log into the console and go to deployments and then locate “wsm-pm” and select Start > Servicing all requests. You may need to restart one of the managed servers but all being well the state of the deployment should show as active. To verify the policy manager status a validation web page can be accessed. 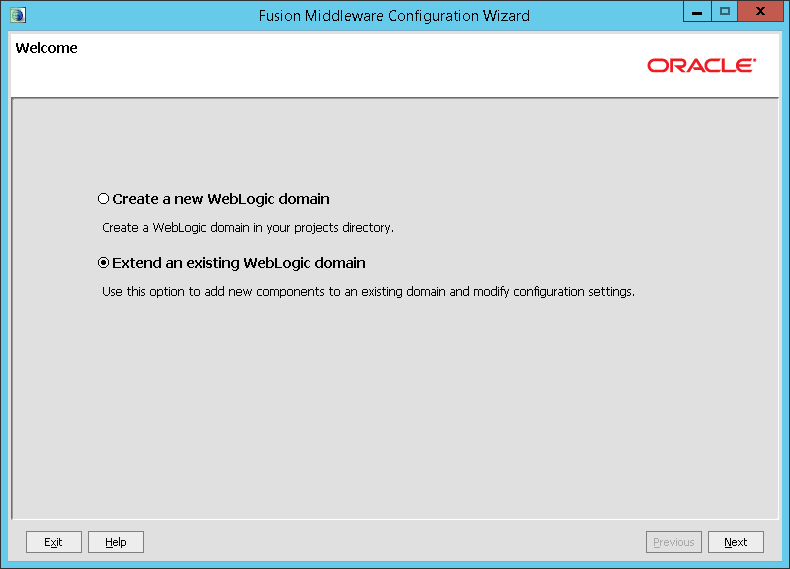 Right on to the next step which is to an external provider in WebLogic admin console to allow authentication in the Web Services. 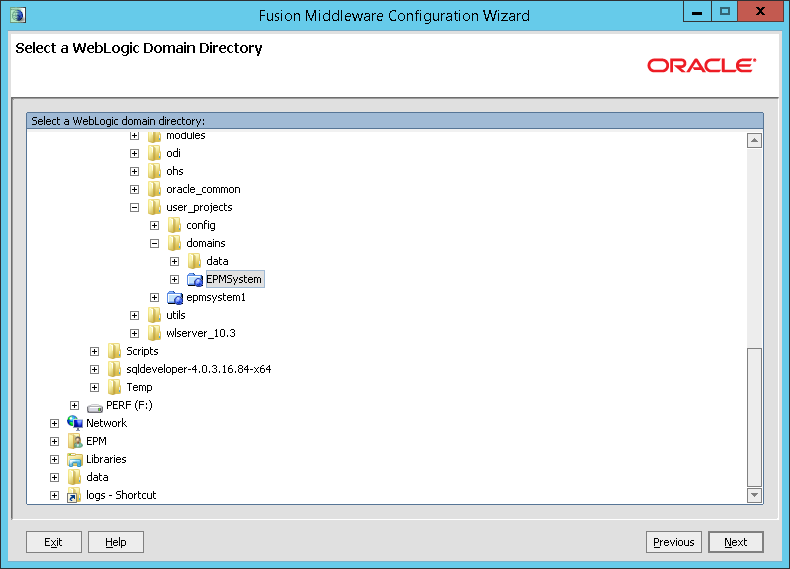 The configuration has to match that of an external directory configuration in Shared Services. 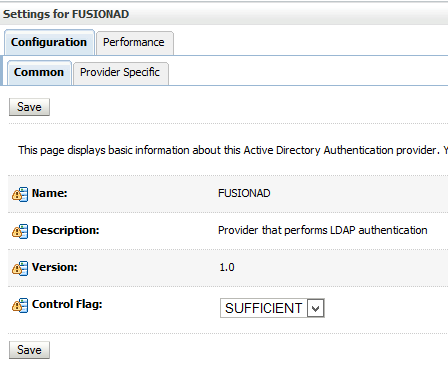 In my example I am using a MSAD connection which has already been configured in Shared Services. 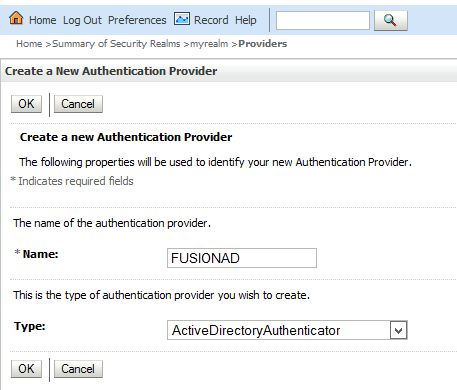 In the WebLogic admin console create a new authentication provider and select the type of provider. I usually set the control flag as sufficient for both the newly added provider and the default authenticator to stop authentication issues with multiple providers. Then it is just a case of populating the provider connection information, the problem with WebLogic is you never know you have got it right until a restart. Once the admin server has been restarted you should be able to view users from the external directory. If you don’t see the directory users then analyse the errors in the admin server logs. Now time to deploy the DRM web services application. The web application should be located in the api directory of the DRM installation. 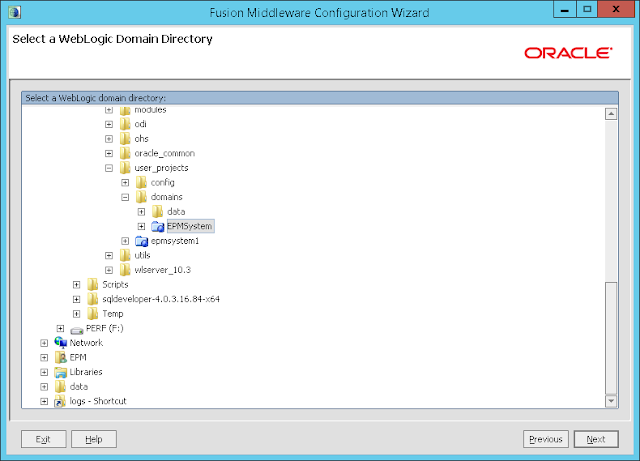 In the WebLogic admin console install a new deployment and go to the above path and select the web services ear file. 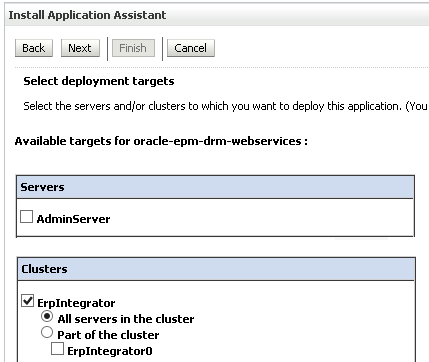 Install the deployment as an application and then select the target cluster to deploy to. As I am going to be using the Web Services primarily with FDMEE I chose that as the target. The remaining configuration screens were kept as default. Activate the changes and restart the target managed server if it is running. Start servicing all requests and the state should then change to active meaning the DRM Web Services application should be running. Policies can be directly attached to Web Services or globally attached by creating a Policy Set, I am opting for the Policy Set method. Enter the EPM WebLogic domain name and DRM Web Services application name. Once saved the policy should be applied the next time the managed server is restarted. 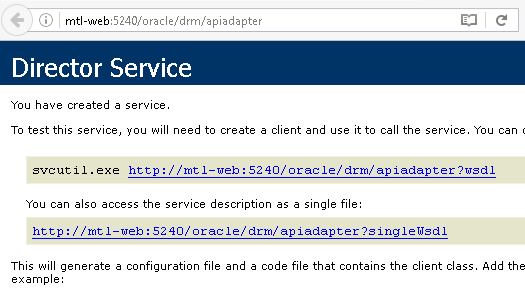 Next the API adaptor requires configuring the DRM configuration console. One final configuration I usually add is to the OHS configuration to allow the DRM Web Services to be accessed through the web server. On to testing to confirm all these configuration steps have been successful. 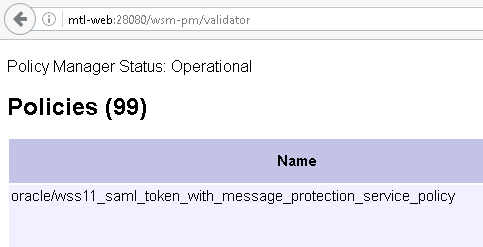 The WSDL is returned which confirms the DRM Web Services are running and can be accessed through the web server, the policy has also been correctly attached. 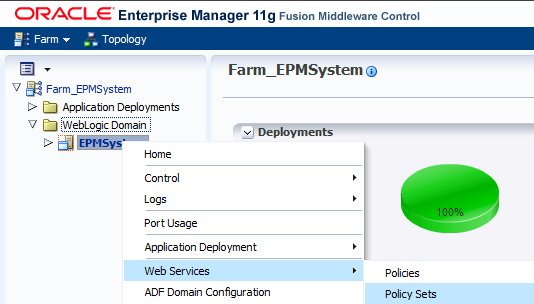 Finally to test one of the Web Services operations using Enterprise Manager, it is a bit clunky but does its job. Enable OWSM security policies and use a valid external directory user that has been provisioned in DRM. To be able to execute the operation successfully a header is required to be inserted into the XML view which defines the parameters for the DRM API adaptor. If all is well no errors will be generated and a successful response should be returned. I am going to leave the post here as the Web Services have now been confirmed to be running as expected. 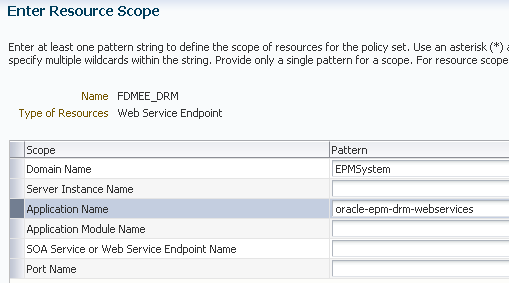 In the next part I will go through the steps to start integrating FDMEE with DRM and look in more detail at what is happening behind the scenes with the Web Services.